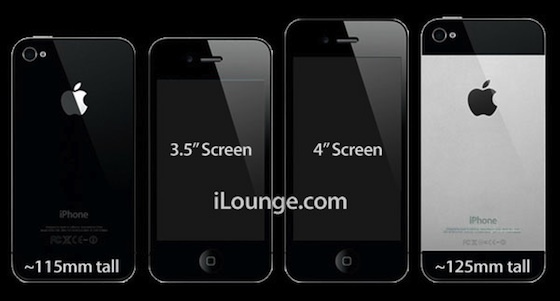 According to a report by iLounge, the iPhone 5 or “new iPhone” will feature a taller body, expanded 4-inch screen and twenty percent reduction in overall thickness. The “repeatedly reliable source” quoted in the report claims that Apple will not be adopting an aluminum teardrop form factor for the iPhone 5, and will instead be continuing with a glass-backed design. The incorporation of Gorilla Glass 2 into the device is said to allow for equal strength, at a lower thickness, than the previous iPhone. The change in device dimensions is said to only affect the height (tallness) of the device, with the increase in screen diameter coming to 4″ on the diagonal from the iPhone 4S current 3.5″ diameter. The validity of this rumor is questionable, as the addition of pixels only to the top and bottom of the screen would lead to a change in the aspect ratio of the device for the first time since the original iPhone. This would result in all 3rd party apps being incompatible with the iPhone 5 – obviously a counter-intuitive move for Apple. Additionally, the report makes mention of a completely new Dock Connector for the iPhone 5. The new connector apparently has fewer pins than the current 30-pin dock, and will be much smaller. However again, without knowing what benefit this would confer upon the device, this would seem a counter-intuitive move given the vast array of 3rd party iOS accessories that would no longer be compatible with the iPhone 5.